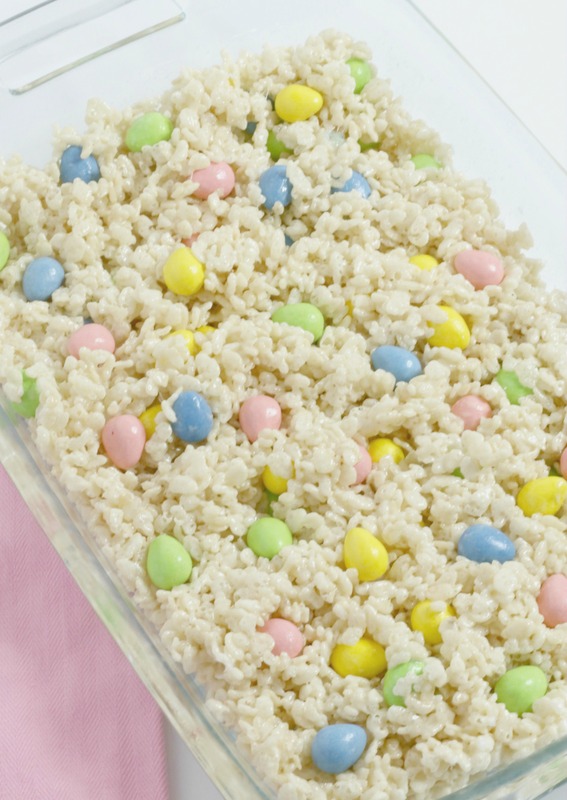 This delicious peanut butter Rice Krispie Treat recipe is filled with Reese’s Pieces Eggs and perfect for Easter! These really are the best Rice Krispie treats and perfectly festive for the holiday! Who doesn’t love a delicious rice krispie treat? They are super easy to make, require very minimal ingredients and they are DELICIOUS! I mean, they are literally mixed with gooey marshmallows. So yummy! 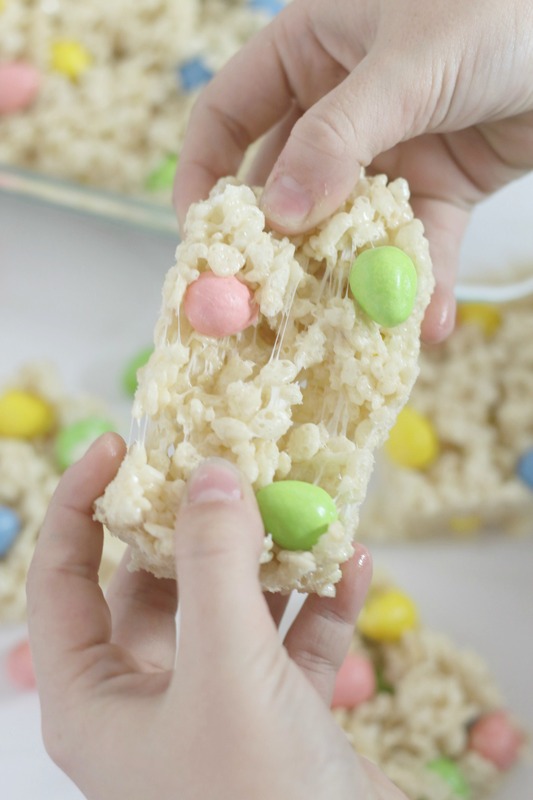 Although Rice Krispie treats are delicious on their own, these rice krispie treats are even better. They are filled with Reese’s Pieces Eggs. You guys, have you tried the Reese’s Eggs? They are AMAZING! 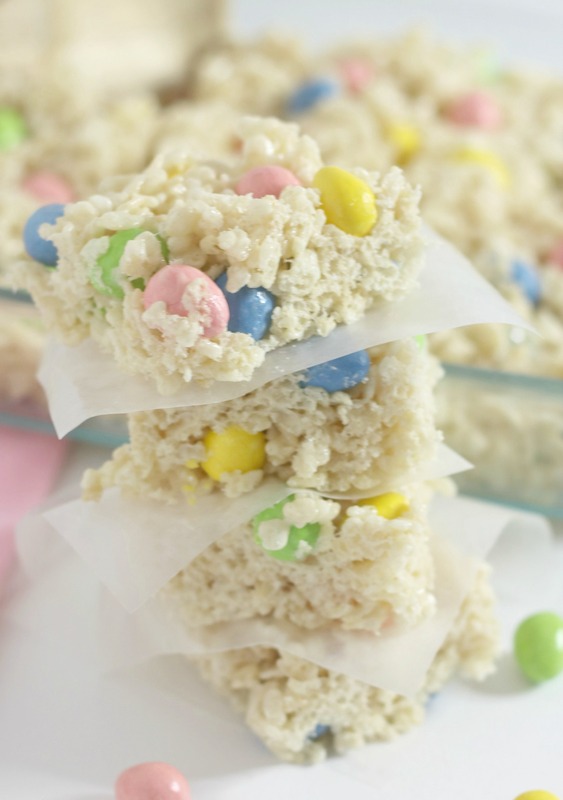 We added them into this treat and now they are literally BEST Rice Krispie Treats ever! I always love to get into the kitchen with the kids for holidays and make one of their favorite treats. This year, these were on the top of the list! If you are looking for the perfect Easter treat, try this one! I know you will love it! Like most Rice Krispie Treats, these are super easy to make. Melt butter in a sauce pan, add marshmallows and stir until melted. Remove from heat and stir in Rice Krispie cereal. Let cool for a couple of more minutes and then pour in your Reese’s Pieces eggs and mix into your Rice Krispie mixture. I love getting the kids involved when making treats in the kitchen. They are great at pouring in the ingredients and love to see how it all comes together! Add melted peanut butter into your marshmallow mixture to add extra peanut butter flavor! Try using Fruity Pebbles, Cocoa Pebbles or Cinnamon Toast Crunch! Although I do not think you will have any Rice Krispie Treats left over, you can freeze them. Be sure to cover them with wax paper in an air tight container. They will stay good for up to 6 weeks. How to soften hard Rice Krispie Treats? If you make your treats ahead of time and want to keep them from getting hard, place 2 pieces of white bread on top of them when storing. They will stay good for at least 2 days at room temperature but will not get hard. Can you microwave Rice Krispie Treats? If you are low on time, you can also melt the butter and marshmallows in the microwave. Be sure to microwave for a minute and stir and then repeat until completely melted. This recipe really could not get any simpler. I hope you will add it to your Easter menu. It will be a definite fave! 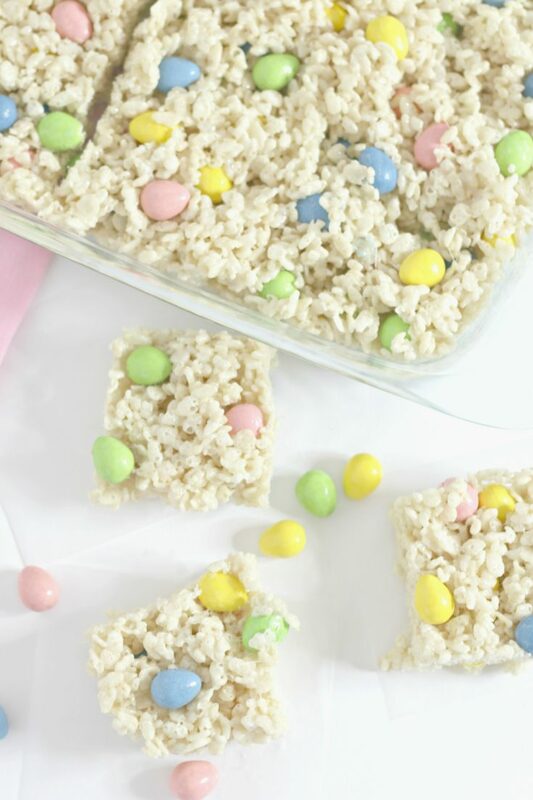 This delicious peanut butter Rice Krispie Treat recipe is filled with Reese's Pieces Eggs and perfect for Easter! These really are the best Rice Krispie treats and perfectly festive for the holiday! Once butter is melted, add marshmallows and stir until melted. Remove from heat and add rice krispie cereal. Allow cereal mixture to cool for a couple more minutes then stir in Reese's Pieces Eggs. Spread mixture into 9x13 pan coated with cooking spray. Store up to 2 days at room temperature.